Boat is located in Bermuda ‘Sail Boat’ Ericson 38’ Shoal Draft Cruiser. Ericson 38’ (12m) 1986 An exceptionally well built suitably equipped performance cruising sailboat capable of fast, safe offshore passages in a wide range of conditions. Her innovative cabin, layout, and systems are optimized for shorthanded offshore cruising in comfort and safety. A lot of systems has been replaced, installed new, or upgraded between 2016 and today making Merrimist one of the best value for money in her range. Ericson 38-200s were considered premium yachts in their day and it still shows today. The mast is keel stepped on the Tri-Axial Force Grid. Her engine and systems have been expertly maintained to professional standards by her current owner, Anthony, 30+years marine engineer and AYC sailing instructor. 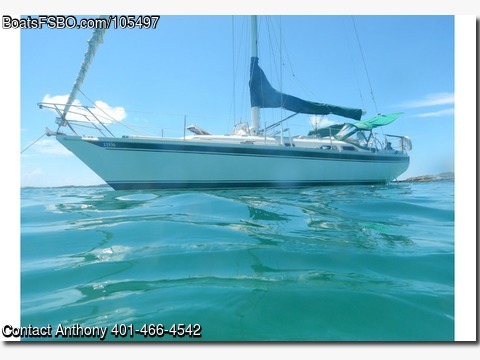 Merrimist is “turnkey” ready to live aboard, day/weekends or sail with family/friends, both socially on a weekend for fun raft ups, Wed nights summer series racing round the cans, or sail off to further adventures Caribbean and/or round around the world. Whatever your desire, Merrimist is capable and will not disappoint. Merrimist has had more than 10k in upgrades over the last 30 months.